Physicists at the University of Sussex are at an advanced stage of developing alternative touchscreen technology to overcome the shortfall in the traditional display, phone and tablet material that relies on electrodes made from indium tin oxide (ITO). They have now shown that not only is the material suitable for touchscreens, but that it iss possible to produce extremely small patterns (pixels), small enough for high definition LCD displays, such as smartphones and the next generation of television and computer screens. The study, led by Sussex Professor of Experimental Physics Alan Dalton, investigates some of the intricacies of patterning silver nanowire films to produce detailed electrode structures. The paper, Finite-size scaling in silver nanowire films: design considerations for practical devices, is published in the journal Nanoscale. Previous research by Professor Dalton's group has shown that silver nanowires not only match the transmittances and conductivities of ITO films but exceed them. This makes the material very attractive for touch screens. However, the group have now shown, for the first time, that this type of nanomaterial is compatible with more demanding applications such as LCD and OLED displays. Professor Dalton said: "Display technologies such as LCD and OLED form images using pixels. Each pixel of these displays is further broken down into subpixels; typically, one each for red, green and blue colours. 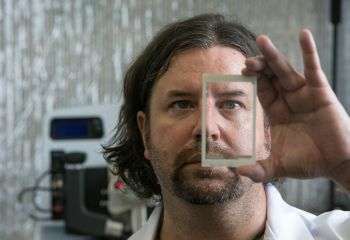 In the display in a smartphone, for example, these subpixels are less than a sixth of the width of a human hair - which is also similar in length to the silver nanowires used in our research." Dr Matthew Large, the lead author of the paper, expanded: "In this research we have applied a mathematical technique to work out the smallest subpixel size we can make without affecting the properties of our nanowire electrodes. This method was originally developed to describe how phase changes like freezing happen in very small spaces, The results tell us how to tune our nanowires to meet the requirements of any given application." Professor Dalton said: "Silver nanowire and silver nanowire/graphene hybrids are probably the most viable alternatives to existing technologies. Others scientists have studied several alternative materials, but the main issue is that the majority of other materials do not effectively compete with ITO or they are too costly to produce, at least at the moment."